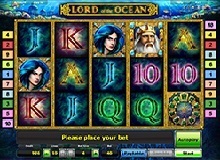 Lord of the Ocean is an entertaining and enchanting aquatic themed video slot by Novomatic Games. The game is inspired by Poseidon, the deity of the sea and king of other ocean gods in Greek Mythology. The setting encompasses a range of cool aqua themed symbols and various shades of blue in the background to invoke the thrills of the high seas. The machine has a return-to-player factor of 96.10% which is well above the average, and medium volatility. As you play this game, you’ll be impressed by the richness of the free spins rounds which feature expanding symbols. Read on to learn more about the game mechanics before you can try out Lord of the Ocean casino slot online. 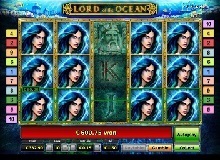 Lord of the Ocean slot has a pretty basic grid layout of 5 reels, 3 rows, and 10 paylines. The paytable features a range of symbols spanning across the marine theme and regular playing card values. They include Poseidon, who is the deity of the ocean, a Gate, Mermaids, a Chest of Treasures, Amulets, and Poker card values A, K, Q, J, and 10. Poseidon is the wild symbol on the grid, and he can substitute any other icon except the scatter to form winning combinations. 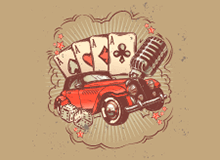 The scatter icon is the Gate, and this is the element that unlocks the Lord of the Oceans free spins bonus. Lord of the Ocean is one of the most straightforward slot machines that you can find in casinos online. The rules are simple and you can quickly master the gameplay regardless of whether you’re a novice player. Before you can begin the game, you need to choose how many play lines you wish to activate then proceed to select a wager for each. The options range from €0.01 to €10, meaning that the cost of a round ranges between €0.10 and €100 if you’re playing all lines. After setting your bet, the next thing is to hit the PLAY button to get the reels rotating. For those who don’t like spinning the reels manually, you can use the autoplay feature to set automatic rotations then sit back and relax as you watch the characters align on the paylines. For you to win in Lord of the Ocean game, all you need is to land a set of at least 3 matching symbols on successive reels, in a left to right arrangement. You can also form combinations with the help of the wild card. All wins pay left to right, and your line bet and symbol multiplier determine your reward for each round. Regarding payouts, the most rewarding icon on the paytable is Poseidon who pays at the rate of 5000x your line bet for the highest combination, and this is the jackpot reward. It is followed by the Mermaid icon which awards cash prizes of 5x, 40x, 400x, and 2000x your line bet for a set of 2, 3, 4, and 5 similar icons respectively. Q, j, and 10 are the characters with the least value, but they still come with very decent payouts worth 5x, 25x, and 100x your line bet for 3, 4, or 5-of-a-kind respectively. You’ll also notice that the Amulet, Treasure Chest, Mermaid, and Poseidon start paying at 2-of-a-kind. Apart from the payouts from the regular symbols, you can also get scatter reward worth 2x, 20x, or 200x your total bet for landing 3, 4, or 5 Gate symbols randomly on the screen. Apart from the remarkable payouts in the paid game, you can also boost your payback tremendously with the help of a rich free spins round. This bonus feature is triggered by getting 3 or more scatters on any random position on the screen. You start with 10 free games, but you can get another 10 free spins if you get 3 or more scatters during the round, and this trend can go on and on. In addition, you get to play with special expanding symbols and all your winnings during this feature are multiplied by 2. These amazing freebies increase your chances of cashing in on the game particularly if you intend to play Lord of the Ocean for real money. This feature is for the ardent gambler who loves taking risks. After each winning round, you can opt into the gamble feature which has the potential to double your money if you correctly guess the colour of a face-down card. You can do this up to 5 times if you’re lucky. Lord of the Ocean is one of the most enthralling casino slots you can find on the internet today, and once you delve into the gameplay, you’ll not want to stop. The beauty of this gaming machine lies in its simplicity and richness, and it is one of the few casino slots that will fascinate you with its regular and decent payouts all through. If you’re looking for an immersive game that is equally rewarding, set out for the high seas with Poseidon and He might lead you to a chest of treasures. 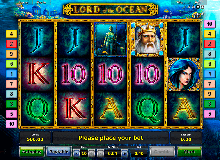 You can play Lord of the Ocean slot machine online across all devices, including your smartphone.